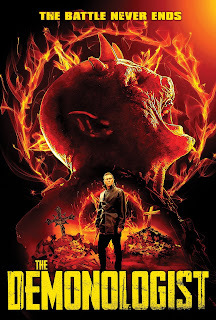 When Detective Damien Seryph (Brian Krause) and his partner are sent to investigate a series of ritual killings plaguing the city, Seryph discovers that a cult of humans and demons are setting up to bring fourth the 4 king demons of Hell to Earth. Through his investigations Seryph discovers that all who are close to him are involved in this in someway and that they have been keeping huge secrets about his true identity from him. It is because of these horrific murders he discovers his powers and that he is in fact a demonologist. Focusing on the positives first; the demons make up and costumes (bearing in mind the obvious low budget) are great. It's just a shame that the voices are so distorted its very hard to understand what they are saying. The SFX on the murder victims are also not bad at all. That is pretty much it for the positives on this, the rest of the elements in this are just incredibly boring. It took me a couple of days to finish watching this as I fell asleep several times whilst watching it. Even when I felt totally alert to start with I was guaranteed to start drifting off after 20 minutes when watching it no matter where I was in the movie. There is no enthusiasm from any of the cast at all, bar a short outburst from one of the detectives which woke me up momentarily. The dialogue is rather bizarre and the acting laughable particularly from Krause who I did not warm to at all. Manon Pages as Meredith who was supposed to be the Devil in human form was really cringey as well. It's confusing and slow to start and then rushes very quickly through a large final plot reveal that leaves you feeling flat and disinterested in everything surrounding it. It may also leave you uttering the dreaded words "Good God, please don't let there be a sequel"!! !